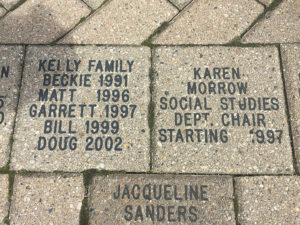 Leave your legacy on Waubonsie Valley’s Pottowatomie Patio with an engraved brick. As a coach, club sponsor, parent, grandparent, or even a group of friends, you can purchase either a $50 brick (4” x 8” = 3 lines) or a $100 brick (8” x 8″ = 6 lines). The Pottowatomie Patio was the Class of 2001’s gift to Waubonsie Valley. Since then, the engraved bricks have grown to over 1,000 messages that reflect tributes, memorials, graduation announcements, and sport’s & club’s landmark moments. Bricks are ordered in December and May each year and make memorable holiday or graduation gifts. The deadline to order is Friday, May 18. For more information, Diane Sabathne at (630)375-3310 or e-mail diane_sabathne@ipsd.org.